The Rokademy Experiment Destroys XMAS: with LOVE. Photo courtesy Matthew Alvin Brown. It’s the most wonderful time of the year! It’s so wonderful, sometimes you just can’t stand it. By mid-December, even the jolliest of holiday elves needs a little break. You may even be tempted to turn off the Christmas shopping radio commercials, roll up the windows to block out the wintry Oklahoma wind, and blast some not-so holy night rock ‘n roll power tunes. But, there’s an even better option for the steering wheel singer in us all! Just in time for a temporary reprieve from caroling and cocoa comes The Rokademy Experiment’s Christmas rock concert. 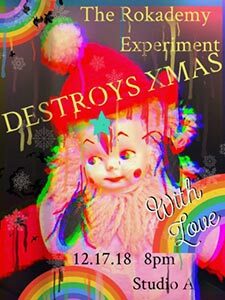 The Rokademy Experiment Destroys XMAS: with LOVE features some of OKC’s finest musical students. This group of true rockers is led by rock musical theatre icon Matthew Alvin Brown, and together they’ve written a brand new holiday song. The new anthem, “Christmas Muscles”, will be featured alongside other classic tunes by the likes of John Lennon, The Ramones, The Zombies, and more. Did we mention the students are ages 13 to 18? Impressed yet!? Attending this fun event means not only hearing some awesome music and having a great time, but also supporting the arts and young talent in our community. Nothing is more rock ‘n roll than that! This hard rockin’ show is Monday, December 17th at 8 PM at Lyric’s Thelma Gaylord Academy- Studio A, located at 1801 NW 16th Street, OKC OK, 73106, in the Plaza District. To feel the love Christmas style, visit this link or lyrictheatreokc.com .